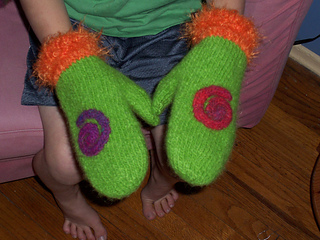 Felted child’s mittens in three sizes with unfelted ribbed cuffs knitted after felting by picking up stitches from a provisional cast on in cotton yarn. The smaller needles listed are for knitting the ribbed cuffs. Yardage requirements include yarn for cuffs in same or contrast color yarn. NOTE: Pattern photo shows a needle felted design on the hands and contrast cuffs knitted with a carry along novelty yarn.